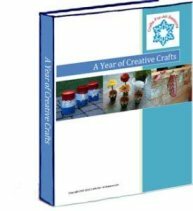 These can be made for any holiday, substituting in the colors of choice. Think about making some in your child's school colors to show school spirit, or your favorite home sports team (and they are perfect for cheerleaders or girls on a dance team). 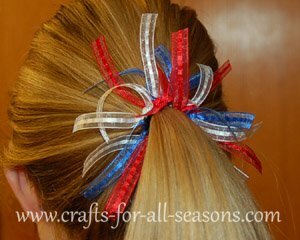 Many craft stores sell ribbon by the yard, making this a very inexpensive hair accessory to make! 1. Begin by cutting the ribbon into 6 inch lengths. 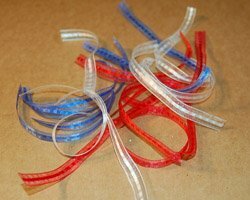 You should end up with 6 pieces each of red, white, and blue ribbon. 2. 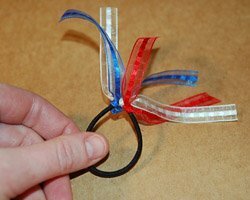 If the ribbon frays easily, an optional step is to dip each end of the ribbon into fabric stiffener, or a bit of glue, and allow to dry. 3. 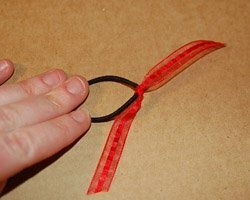 Begin by tying one length of ribbon around the elastic band, in a simple square knot, as shown below. 4. 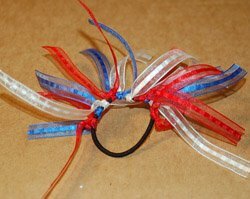 Continue to tie the ribbons around the elastic band, alternating red, white, and blue. 5. Continue all the way around until you have tied all 18 ribbons. 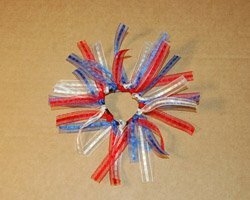 Now it is ready to wear it in your hair!